Your average zombie movie doesn’t really put much stock in hope, I’ve noticed. From 28 Days Later to Evil Dead, to I Am Legend and Resident Evil, most of these aren’t really about times when the world was close to the brink but got better. It’s pretty much all downhill from here. 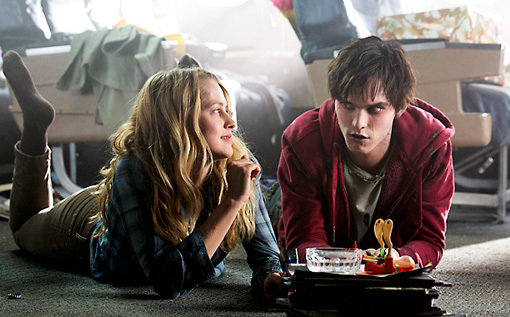 This is a big part of what makes Warm Bodies so compelling. Without spoiling anything the trailers haven’t already made clear, this is a zombie movie with a heart. A beating heart, specifically, one which says that maybe the end of everything isn’t actually, and that sometimes all the apocalypse needs is some love. It’s very good. You should watch it. 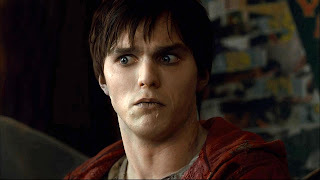 Warm Bodies, which just came out last week, stars Nicholas Hoult of X-Men: First Class and the upcoming Jack the Giant Killer fame (he also starred in the UK’s Skins and made his debut opposite Hugh Grant in About a Boy, which makes me feel old). 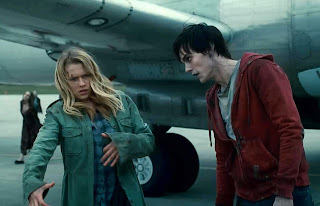 Hoult plays R, a zombie, who falls for the lovely Julie (Theresa Palmer) and challenges the future of all of zombie-kind. It also has Rob Cordry as R’s friend (mostly nameless, because, you know, zombie), Analeigh Tipton as Julie’s friend, and John Malkovich as Julie’s incredibly terrifying father. Oh, and Dave Franco as her ex-boyfriend, which is a little confusing. Did we know there was another less-talented Franco running around? Is that a thing? He seems to be in everything these days. Anyway, the plot of the movie is basically just a rehash of Romeo and Juliet, even down to the character names, but there are some fun twists, aside from the super obvious one. Like in Witch Hunters, everyone is pretty self-aware and the profanity in the script is used to devastating effect. There are lots of comments on zombie movies in general, best scene in the moment where Julie holds a DVD of the movie Zombie next to R’s face to compare. The drama, of course, comes from the fact that Julie is human and R is a slavering zombie. Her father is also the leader of the humans, and completely against the idea of a “good” zombie (her mother was turned and I guess it’s a whole big thing, but I didn’t pay much attention to that part). Julie and R have a romance for the ages, hindered on a little bit by the fact that he ate her ex-boyfriend’s brain. It’s funny, well written and cute, and a darn good love story. Really, you should go see it. Maybe on Valentine’s Day? Now, back to the larger point. Hope is something we all seem to be lacking these days. As the economy continues to stink, unemployment remains at levels that affect us all, and most of us are working our butts off to pay minimum payments, it’s pretty hard to look around and be happy with the world. I mean, it’s pretty hard on a good day. On a bad day, I find myself actually looking forward to an apocalypse. At least we’d probably get some fresh air and exercise. This is a bad attitude. I know it’s a bad attitude, but it’s hard to get rid of. Movies like Terminator, where nothing ever actually gets better, or 2012, or the aforementioned Resident Evil series underscore our societal belief that life is going downhill, fast. But isn’t that a self-fulfilling prophecy? Okay, this part does actually contain SPOILERS for the movie, so be warned. I mean, they won’t ruin the movie for you, but they do tell you what happens. We don’t ever find out what happened to make the zombies, and we don’t really care. R is a zombie and that’s all we need to know about him until he starts to come alive again. And that’s the key part. The apocalypse in this story isn’t the end, it’s the beginning. The zombies might be semi-mindless killing machines, but that doesn’t mean they can’t be saved. In fact, the film makes a point of showing the difference between those zombies that have chosen despair and hunger versus those who have held onto their humanity and hope. The difference is, in a word, vital. Hope isn’t just some fluffy little cloud to keep the bad thoughts away. The movie shows clearly that hope for a better future, for human kindness, or even for a kiss from a pretty girl, can change the world. Hope is an active emotion, and one that we desperately need. If we act in hope, then we assume that there is something we can still do. If we fall to despair, then we become passive recipients of the ickiness in the world. Hope matters. And while this is a cute movie about a zombie falling in love with a girl with a machine gun, it’s also an antidote to our culture. We have chosen despair a lot over the past thirty years, and it’s time for that to change. The future can be better than the present, if we just decide to get off our butts and hope for it. "Don't be creepy don't be creepy don't be creepy." R's internal monologue is the best.